Prosperous United's last result was a 2-2 draw away against Monasterevin AFC. Sallins Celtic's last game was a disappointing 1-3 loss at home against Rathangan AFC. Sallins Celtic's last game was a 1-6 win away against Kilcullen AFC. Kilcullen AFC has yet to win in this competition. BBC United has yet to be beaten in this competition, having won 3 out of its last 4 games. Sallins Celtic has yet to win in this competition, having lost all 4 games. BBC United's last game was a crushing 3-11 win away against Sallins Celtic. Sallins Celtic's last game was a crushing 3-11 loss at home against BBC United. 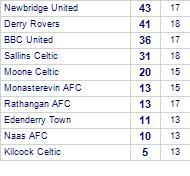 Sallins Celtic has yet to be beaten in this competition, having won 2 out of its last 4 games. Kilcock Celtic has yet to win in this competition. Sallins Celtic despatch Naas AFC. Naas AFC has yet to win in this competition, having lost all 2 games. Sallins Celtic lose to Rathangan AFC. Sallins Celtic beaten by BBC United. Kilcullen AFC lose to Sallins Celtic. Sallins Celtic lose to BBC United.